Core210 CPU board is a high-performance Cortex A8 core board. It uses Samsung S5PV210 as the main processor, running at up to 1GHz. Integrated PowerVR SGX540 S5PV210 internal high-performance graphics engine, support for 3D graphics run smoothly, and can be smooth to play 1080P video of the large size. 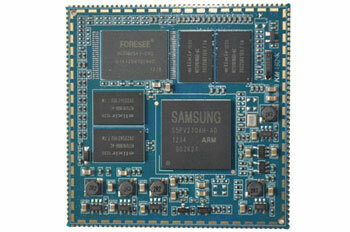 Core210 onboard 512M DDR2 memory and 512MB Nand Flash, and can smoothly run advanced operating system, Android 2.3, Android 4.0 and WinCE6. It is ideal for the development of high-end Internet of Things, advertising, multimedia terminal, smart home, high-end surveillance system, video game control panel device. This CPU module can be purchased with a development board. CoreWind also offers customer design service based on the Core210 board according to customer’s requirement. Whether you need to reduce, add or modify to existing hardware, CoreWind will help customers with expert competence and rich experience.